Aivan.ai is a zero-effort contract lifecycle management solution. From the user’s perspective, archiving a contract is as easy as sending a single email. Aivan.ai is designed to save time and worry. 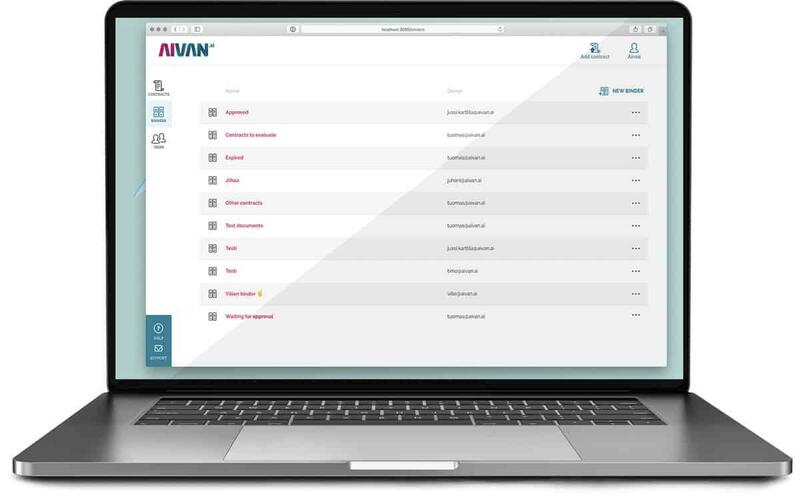 Depending on your needs, you can use Aivan.ai to quickly archive contracts and then simply forget about them. Or, you can use it to actively share contracts and collaborate with a global team. It’s totally up to you. To archive a contract, simply send it to a dedicated, customizable email address. An AI-powered processing engine analyzes and indexes the entire document. Discover details and filter data quickly and intuitively. Every word in the contracts is searchable. Key details, such as contract parties, are automatically identified. Automatic reminders ensure that you never miss contractual dates. Keyword alerts notify specific team members of specific contractual terms, for example. Get a high-level view to all your contracts. Individual contracts are organized in smart dynamic binders with visual thumbnails for easy browsing. You control who can see and access the contracts. Shared access eliminates bottlenecks and reduces risks for contractual liabilities and lost opportunities. Access control ensures that classified material remains eyes-only. All data managed by Aivan.ai is securely encrypted and safely stored. AI-assisted processing makes contracts available on-demand to selected team members, enables rich searches and automation benefits, such as reminders. Data security and privacy are our top priorities. We ensure security on many levels, from meeting strict regulatory requirements to software architecture and physical security. For more information, contact our security team at safe@aivan.ai. 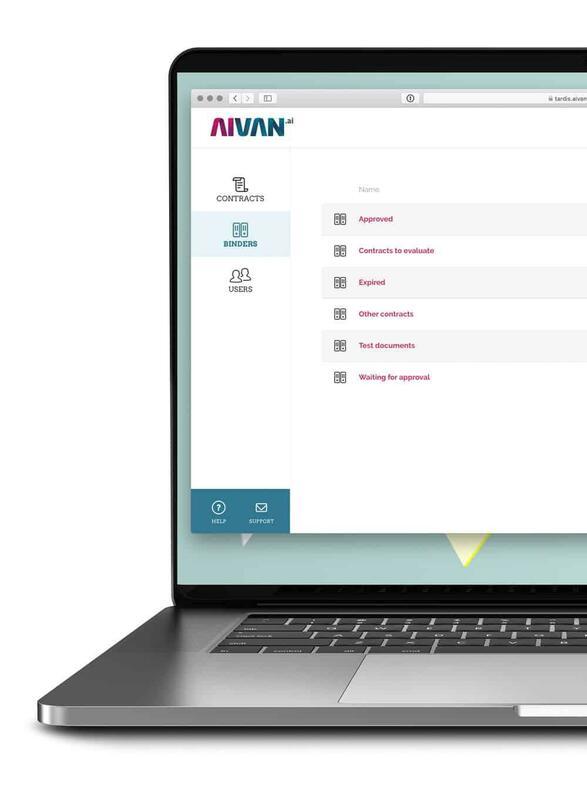 You can automate data import by integrating Aivan.ai with your existing document management systems. Our system is also fully compatible with multiple electronically signed contracts. 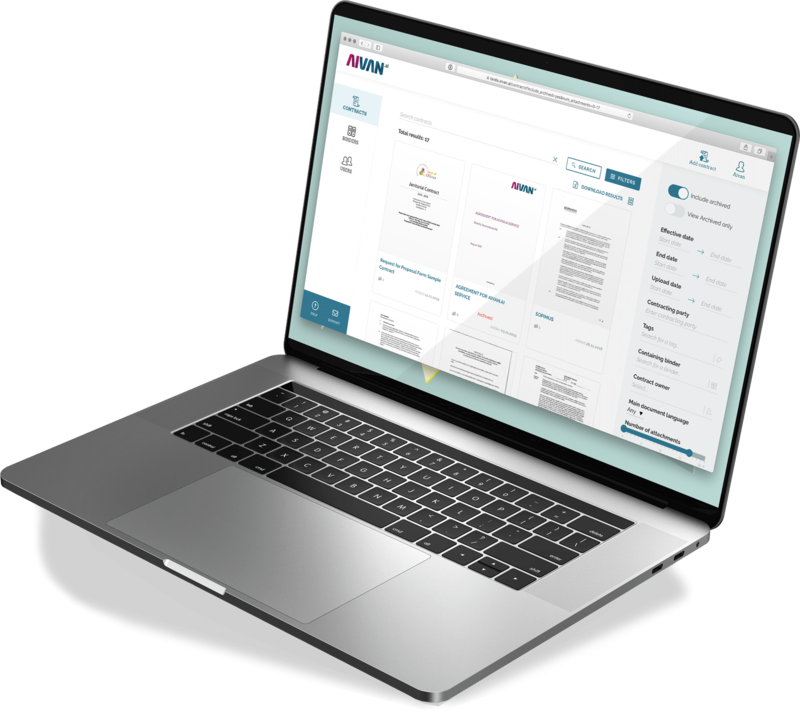 Aivan.ai can be easily integrated with various leading enterprise solutions, such as document management systems.